Following our story on the RESCO model of promoting rooftop, there is another good news for the solar market in Delhi. The Delhi air pollution is taking a toll on people’s general health and well being. It is high time that the government starts incentivizing using solar technology in the city. In order to boost solar in Delhi, the cabinet has decided to launch the Mukhyamantri Kisan Aay Badhotri Solar Yojana. As the name implies this program is directed toward increasing the farmers’ income through solar installation. According to Delhi’s chief minister, farmers could earn 3-4 times their current annual income under the scheme. How can farmers earn from Solar? All the farmers have to do is install solar panels on a maximum of one-third portion of their total farmland. Many private companies have come forward to do so under the RESCO model. This would not entail any upfront cost to the farmers. In return, the farmers will be able to earn up to INR 1 lakh rupees per acre, per annum as rent with a 6% annual increase for 25 years. In addition, the farmers will also be able to access 1000 units of free power. The electricity will be sold by the private companies to the government departments like health, public works, Delhi Jal Board, etc at just INR 4-5 per unit, which is way cheaper than the INR 9 per unit they are currently paying. The government is expected to save INR 300-400 crore using power from the solar scheme. The scheme will not only boost solar adoption in the polluted Indian capital but will also provide an additional means of income for the farmers who are always financially distressed. 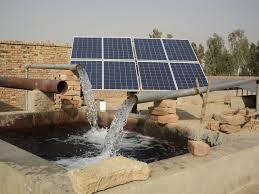 The solar panels would be installed conveniently without disturbing the farming activities. By the end of the 25th year, a farmer could earn more than INR 4 lakhs from this scheme. The Indian farmers are already benefitting from various solar products like solar powered water pumps, microgrids, etc. Not only at the farms, solar technology is also improving their lifestyle at homes with solar lights, solar mobile chargers, solar fans etc. The Mukhyamantri Kisan Aay Badhotri Solar Yojana should also be a good way of earning extra bucks with no extra work or investment. I think it is a good way of diversifying their income and also promoting clean and sustainable power generation.